Bird's eye view Suddar Bazaar [Karachi]. bl.uk > Online Gallery Home	> Online exhibitions	> Asia, Pacific and Africa Collections	> Bird's eye view Suddar Bazaar [Karachi]. Photograph with a view of Saddar Bazaar, Karachi, with the Empress Market in the right background, taken by an unknown photographer, c.1900, from an album of 46 prints titled 'Karachi Views'. Karachi, one of the world's largest metropolises, was once the capital of Pakistan. It is now the capital of the Sindh province in the lower Indus valley, and is the financial and commercial centre of Pakistan. This huge city was however developed only in the mid-19th century after the British conquest of Sindh. Karachi is built around a bay which is a natural harbour protected from storms by a group of small islands. Its history prior to the 18th century is sketchy but it is believed to be the ancient port of Krokala on the Arabian Sea, visited by Alexander's admirals in 326 BC. The small fishing village was known as Kolachi-jo-Goth in the 18th century, and then became a trading post under the Kalhoras and the Talpur rulers of Sindh, but the port remained small. With the British development of its harbour it grew into the large city of Karachi and an important centre of trade. Sadr Bazaars were permanent markets which existed all over the Indian sub-continent, they were developed by British forces in the towns they occupied to facilitate the provision of supplies to the troops in the cantonments. 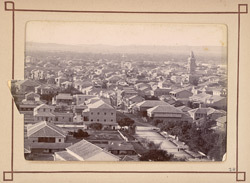 The Saddar Bazaar at Karachi followed a typical gridiron plan; all the major north-south streets of the Bazaar were laid out at right angles to Bunder Road, Frere, Somerset and Elphinstone Streets which along with Victoria Road, linked the northern part of the cantonment to the southern part. The area soon developed into the most fashionable part of the city, supplying the needs of both its civilian and military parts.